Most people will have seen damp in their homes in one form or another, and in fact damp is one of the most common problems encountered in houses. Damp can manifest itself in a number of ways including ˜wet patches on surfaces, mould growth and sometimes a musty smell. If left untreated damp can lead to deterioration of internal surfaces and finishes, provide a very unsightly appearance and in certain circumstances lead to health problems, particularly for vulnerable user groups such as the elderly, young children and those with respiratory conditions such as asthma. There are a number of different types of damp that can occur in buildings including rising damp and penetrating damp, however for the purposes of this article I want to focus on condensation. In order to understand how we can deal with condensation it is important to first understand how it occurs. 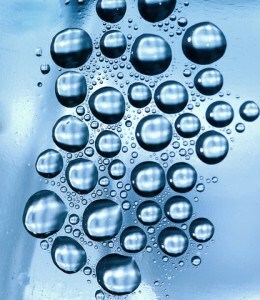 All air contains a certain amount of ˜invisible water vapour. You may not realise it, but as human beings we are emitting water vapour constantly, you may not see it but it really is happening. Water vapour is also emitted by the activities we undertake in the home including washing, cooking, drying clothes, using portable heaters such as calor gas etc. Basically, there are large volumes of water vapour being emitted in your home and the amount of water vapour that is emitted is determined by the activites that we carry out and the number of people in your house at any particular time. Condensation occurs when this water vapour comes into contact with cold surfaces and the air no longer has the capacity to hold any more water vapour. In order to understand this we need to first understand relative humidity, which is generally a poorly understood term. Relative humidity relates to the actual water vapour present in air to that which could be present and is routinely expressed as a percentage. The reason we refer to ˜relative humidity is because air has a varying ability to hold moisture vapour depending on temperature. Warm air can hold more water vapour than cold air. Once relative humidity reaches 100% it no longer has the ability to hold any more water vapour and it will start to condense on cooler surfaces (something referred to as ˜Dew Point), which is the physical change into a liquid (condensation). As an example, think about your bathroom. When you have a bath or shower large quantities of water vapour are produced. Sometimes this will develop into a ˜mist in the room until you open the window or turn on an extractor fan. Have you ever noticed that you get water developing on your windows and walls? This is condensation. Have you ever wondered why this happens more readily on cold days, and in the warmer months it is hardly noticeable? This is because the air in your bathroom on colder days has less capacity to hold moisture than the air in your bathroom during warmer temperatures (remember warm air can hold more water vapour than cold air). Windows, particularly in older buildings are generally less thermally efficient than the surrounding structure such as the walls. Therefore the internal surface temperature of the windows will be a few degrees cooler than the surface temperature of the walls. This will mean that once dew point occurs (100% relative humidity), it will start to condense on the cooler surfaces first, i.e the windows, before it starts to condense on the surrounding walls. Condensation can occur in any room in a house or within the structure of a house (interstitial condensation), including roof and floor voids, basically anywhere, where there is water vapour and cold surfaces. If left untreated condensation can become a significant problem so it is important that people understand how it occurs and how to deal with it. Due to the fact that condensation produces water/moisture it can also act as a catalyst for a number of other defects that can be found in buildings, namely timber decay such as wet rot or dry rot, as well as causing mould growth and potential health problems. You do not need to be a damp specialist or building surveyor to be able to deal with condensation or at least reduce the risk of it occurring. There are numerous products on the market that claim to reduce or remove the risk of condensation in homes including paints and sprays. These types of products may temporarily remove condensation mould that may have already occurred, or cover over damp mould, however the only certain way of reducing the risk of condensation is to understand the root cause, which will vary from building to building, and to deal with these root causes. The usual factors that result in condensation are poor thermal insulation, inadequate heating and inadequate ventilation, or a combination of these. In the next article I will explain how you can reduce the possibility of condensation in your home and if you already have problems with condensation I will tell you how to deal with it. See Damp in Buildings, Part 2: Condensation – How to Reduce the Risk. This content is Copyright of Gary O’Neill – © Surveying Property 2013. All rights reserved. Republished with permission of author. Gary O’Neill is a Chartered Building Surveyor currently working as a Senior Lecturer at Coventry University. Prior to this, Gary worked in private professional practice for over 12 years as a Chartered Building Surveyor with the latter years in Senior Management as an Associate Member. Gary is an RICS APC Assessor. For more insights, visit Gary’s blog, Surveying Property.